What Equipment will I take his time? In late January 2014 I hope to return to Antarctica, this time avoiding the dreaded seasickness of the Drake passage by flying to King George Island from Puntas Arenas in Chile, before boarding the Ocean Nova. So what equipment will I be taking this time and what lessons did I learn from my trip two years ago? The last time I travelled with two 5D mark-II’s, having purchased a second body just prior to my departure. Relying on just one body seemed far too risky for a trip of this nature and rumours of some 5D-II’s failing on previous trips, falling foul to the damp wet weather, did cause concern about their reliability. Thankfully mine came through in fine fettle despite the exceedingly damp, overcast conditions, but one did succumb in similar conditions in Iceland several months later. I also found two bodies quite advantageous when shooting from the decks of the ship; one kitted out with a longer lens, with the other a wide angle zoom. Having two cameras around ones neck can be a bit of a hassle, so having at least one of the bodies fitted with a sling style strap is almost a pre-requisite so highly recommended. I had planned to sell the second 5D-II body upon my return to the UK but that never transpired and it was eventually traded in against a brand new 5D-III. The mark-III is a far better performer than the mark-II in terms of focusing, and higher ISO, and has that all important weather sealing, so I’m now contemplating upgrading my remaining 5D-II to the mark-III for my return trip. You may think this a rather odd selection of lenses to bring, but the trip included a few days in Patagonia, for which I’d included the tilt and shift lens. 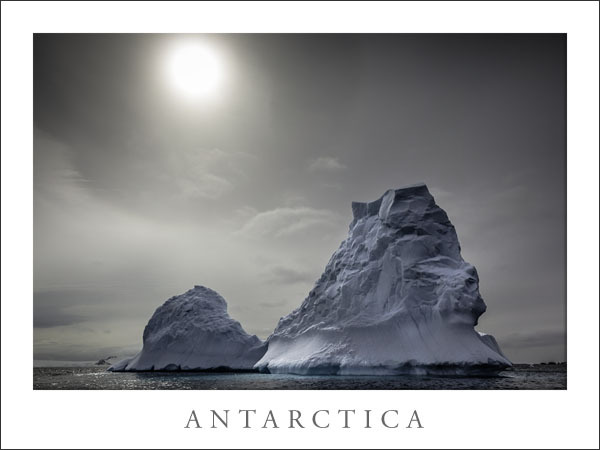 However, there was at least one professional photographer onboard who used a TS-E 24mm whilst in Antarctica. I never did. I found a lot of the people shooting from the deck of the ship (and some from within the zodiacs) often carried two cameras at once, one equipped with a long zoom and the other with a utility zoom lens. I ended up doing the same and found it very useful whilst especially when cruising. With encouragement from Seth Resnick, one of the workshop instructors, I also rented a EF 300mm f/2.8 lens. This is a super sharp lens, and one of the best in Canons arsenal, but personally I found it a little too heavy and bulky to shoot successfully hand-held, especially from a zodiac, unlike Seth who used his all the time but has much better technique and experience handling this lens. Most of the photography on this trip was hand-held from zodiacs or from the decks of the ship, often in gloomy, dull, overcast weather, so lenses with IS or VR were certainly worth their weight in gold. Most of my shots were taken with the EF 24-105mm f/4 and the EF 70-300 f/4-5.6L IS USM lenses. The later is a superb, very sharp zoom lens that’s very easy to handle, thus I found it far more useful than the EF 300mm f/2.8 so the difference in sharpness shooting hand-held became negligible. The EF 24-105mm f/4 is not the sharpest zoom in the Canon range, and probably the weakest in my lens selection. However the 24-105mm zoom range actually made it probably the most useful and eventually the most used lens when shooting from the zodiacs. 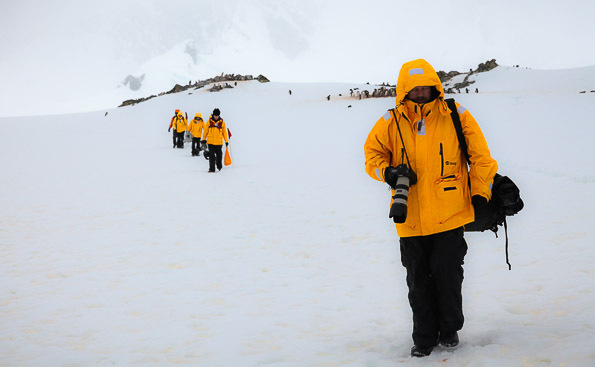 I also took a 16-35mm wide angle zoom and a 24mm T&S lens but neither saw much use in Antarctica. Both were used in Patagonia afterwards however. I regret not trying the EF 16-35 mm f/2.8 much from the deck of the ship, as at times we got so close to some huge icebergs that a really wide angle lens would have been the better choice, and other photographers bagged some great shots where I missed out. For this trip I’m planning on taking the following. You’ll notice the absence of primes. Shooting hand-held from zodiacs bouncing around in the water really renders any advantages in sharpness from a prime lens almost useless. Unless of course, you have great technique. I’d much rather have IS lenses and the ability to reframe as best as possible. For me the zooms are just more practical on a trip of this nature. Added to my lens selection this time around is the new EF 24-70mm f/4 IS L zoom which out performs my 24-105mm hands down. However, the later is still there for backup. I could have gone for the new 24-70mm f/2.8 which is sharper (not by much), but it lacks the all important IS. One major regret was that we were given very little guidance from the course instructors on shooting techniques. This was really disappointing as it took me a good couple of days to get reasonably comfortable shooting hand-held from zodiacs. My approach was initially more akin to landscape photography, and my own inability, trying to shoot with apertures of f/11 or smaller to maximise depth of field, when really f/8 was quite sufficient. I also should not have been afraid to have used higher ISO settings either, rather than trying to keep below ISO 400, which unfortunately resulted in many of my earlier attempts lacking in sharpness and so few keepers. In this respect the 5D-III should prove a much more capable camera under these conditions with its far superior high ISO performance and I wouldn’t really worry that much shooting from 800-1600 ISO if necessary. We had pretty overcast weather almost throughout our Antarctic trip but even then you still needed to compensate around +1-1/3 to +1-2/3 stops for all the white snow. Shooting in aperture priority mode seemed the most logical method to adopt and this worked best for me. On the few occasions I used the tripod during onshore landings I may have used manual mode. There were 73 photographers on our trip, and at times shooting from the decks was more like paparazzi at a film premier, with the sound of shutters rattling off in machine gun like bursts at time. I’m sure some must have shot on auto-drive with their finger continually pressed on the shutter button at times. God knows how many memory cards they must have got through. Unfortunately I too, got pretty wrapped up in this style of shooting at times, thinking it was the thing to do, and I really wish I’d put a bit more thought into my compositions at times, and taken a more time to fully evaluate the scene before me rather than the smash and grab technique favoured by many. This time I’ll be far more selective. Shooting from zodiacs bouncing around in the zodiacs was a steep learning curve and something completely new to me. You’ll just have to practice at that, and try and keep the shutter speed high enough. That’s why I find IS lenses so invaluable. One thing I will say is that don’t be afraid to instruct your helmsman to slow down and make a repeat pass if you don’t get the shot. I was just too dam polite to start off with! I took my Gitzo GT 3541-LX tripod but it didn’t use that much use. It was used on some Island landings for landscapes shots, and it was definitely needed as the light was often poor. It wasn’t much use in the snow however which is very deep, so if you do plan to use one some snow feet may be a wise investment. Not many of the photographers took tripods but I much prefer to use one when I can. I was tempted to take a light weight tripod or even just a monopod but it was pretty dam windy in places, so a sturdy tripod was perhaps a better choice, but bulky of course. I’m going again in January, this time flying to King George Island and will take a tripod, although I’m going to have much tighter weight restrictions this time. Surprisingly I saw no monopods used on our trip, but there again they are probably not that advantageous shooting from the deck of a ship, and of no use in the snow (unless with a snow-shoe), but they have got to be better than hand holding, especially if using a heavy long lens. I did actually try using EF 300mm f/2.8 on the tripod from the deck of the ship, occasionally with extenders too. In each case I had the head loosened and used it gimbal-style. I’d seen Art Wolfe do this on Travels To The Edge and it works pretty well providing you’re cruising smooth waters. Well worth a try. I took my rather large Lowepro Pro Trekker 400 AW photo backpack, but this proved too bulky and really too awkward for use in the zodiacs. Eventually I gave up and ended up leaving the backpack on the ship and taking my cameras on the Zodiac in just a simple dry bag. This worked very well, but I generally only ventured out with one camera and perhaps a second lens on these occasions. I’m going to take my gear down to Antarctica in a Gura Gear Bataflae 26L this time, which is smaller and lighter than my Lowepro Pro Trekker 400 AW. For zodiac use I’ve ordered a Mad Water Waterproof Sportsman’s Backpack. This a not a camera bag, just a fancy but inexpensive roll-top dry bag. I’m looking at putting in some cheap padded camera inserts inside and have seen quite a selection on eBay and Amazon, so I’m going to experiment a little before my departure. I was very tempted by the new Lowepro Dryzone BP 40L backpack, but it looks rather large, is quite expensive and as yet it’s not available here in the UK. If your going to be photographing from the zodiacs it’s inevitable you’re going to get your camera and lenses splashed, plus you may encounter precipitation in the form of rain, sleet and snow and all at the same time! Getting your kit in and out of a camera bag in zodiac doesn’t really work, especially with 7 or 8 other photographers. You need something quick for rain or snow. A simple inexpensive drybag proved by far the quickest and easiest solution. Mine was a Exped Large (13L) Drybag and it was probably the best purchase I made prior to the trip. Be sure to have at least a couple. It was also suggested I purchase an SLR rain hood, such as the Kata E-702 PL Pro Light Rain Cover, which unfortunately I did. I can’t recommend these at all. They are bulky, awfully difficult and time consuming to put on, and make operating your camera terribly difficult, so I’d avoid these like the plague. Far better are the polythene rainsleeves from Optech, which are cheap, see through, and come in packs of two for just over a fiver. If you want something a little more substantial that doesn’t take up too much space, then check out the Storm Jackets from Vortex Media. They are rather expensive but are practical and work well. I took one with me but found the Optech covers my preferred choice. Just make sure you have them tied-on when it gets windy. You’re going to need plenty of microfiber lens cloths to wipe the spray from your lenses, but rather than purchasing expensive ones from the camera dealers, I found microfiber camping towels far better. They seem to be pretty much the same material, lint free, and much larger. 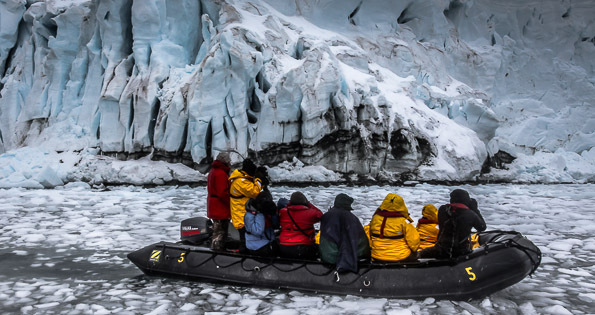 Take several, as by the end of one zodiac trip they’ll probably be wet through so it’s best to have some backups. After a while your lens front may cloud up with salt residue, so a lens spray is recommended. I used the ROR Lens & Filter Cleaning Solution which works very well. Last time around I took my 15-inch MacBook Pro, and backed up all my photographs each evening when on-board ship. I worked on some, but to be truthful I was so knackered each day I left most of my post processing to when I got home. I’d really like to take this again but I’m limited to only 20kg on my flight out from Chile and that includes hand luggage, so I may have to ditch the laptop this time around. If I can’t take it, I may just take an iPad instead, and take lots of SD & CF and record on both as a back up. The jury’s out on which way to go at present. The airlines seem to have become incredibly picky these days with baggage limits, and most now weigh your carry-on baggage at check-in too. This can be really problematic for photographers as our equipment is not only valuable but heavy too, and none of us wish to risk putting anything in the hold unless within something like Pelican hard case. Carry-on limits vary from as low as 6kg to 23kg, but most are around 10-12 kg. Most of us also travel with a laptop too, so with camera bodies, lenses and accessories, that can result in one pretty heavy backpack. On my last trip my backpack weighed around 16 kg (35 lbs). Of course you’re never going to get his past check-in if weighed, but there are some workarounds you can try. My Lowepro Pro Trekker 400 AW photo backpack has a detachable bum-bag (waist-pack) which proved incredibly useful at check-in. It’s big enough to hold my 16-35mm, plus my passport and a few other odds and sods. The other trick is to wear a big coat (note: wear not carry), in my case a Begrhaus rainproof jacket, which also has large pockets, big enough to hide two other lenses. Surprisingly most airlines also allow a laptop in a slip case in an addition to your normal one hand-carry item. Thus I removed my laptop too and this never got weighed. My back weight was reduced to around 12kg and all the items were duly returned there once check-in was completed. Of course all this regulation is complete nonsense on the part of the airlines since you can buy copious amounts of quite heavy, duty free goods when through passport control, and walk straight on the aeroplane. It’s really just a ploy to charge you more money, but I can probably envisage the day they will require us to get on the scales at check-in. Until that day arrives these ploys should work. One other problem people will face traveling down to Ushuaia, is that Aerolíneas Argentinas have a 12kg check-in baggage limit. Luckily this seems to be rarely enforced, and my luggage, which was around 23kg was never even weighed. That aside, it’s going to be pot luck as occasionally some traveller will be charged excess. None on our trip were charged. This trip I’m flying on Aerovias DAP from Puntas Arenas in Chile who operate a strict 20 kg weight allowance, and that includes your hand luggage. This trip is going to be a real challenge weight-wise. Excellent information, thanks a lot! I am leaving for Antarctica as well end of January and your tips came just in time!